Ferrara had a friendly relationship to Jews, which increased in Borso's time. In Tarot research often the argument was given, that the 22 Major Arcana of Tarot should relate to the number of the Hebrew alphabet, a development to which the French occultist Eliphas Levi in Dogme et Rituel de la Haute Magie in 1855 gave deciding impulses. The idea was taken by the Order of the Golden Dawn 1887 and variated in an important point. By this way both lines became very influential upon the appearance of modern Tarot and the theories surrounding it, Eliphas Levis theory formed a special French School, the Golden Dawn manifested an astrological system connected to Tarot for the English speaking world. Modern researches with more intensive historical base gave the result that a kabbalistical influence in early 15th century was rather unlikely, as the whole kabbalistic development in Italy started much later in connection to Pico de Mirandola. During the work of the last year, 2003, we manifested the view, that Tarot alias "Trionfi" in its original form had only 14 special cards, which was quite a revolutionary task one year ago. We did our approach via Internet, leaving the doors wide open for anybody who wanted to discuss in serious manner and in detail. Really opposition never appeared. We didn't perceive any serious counter argument. The question is open again and must be revisited with new eyes. The Trionfi alias Tarot deck got 22 Mayor Arcana probably in the phase between ca. 1460 - 1490 - a time, which is near to kabbalistic influences in Italy. "Under the dukes of Este in the fifteenth century the community developed rapidly. It was the aim of these rulers to strengthen the economic condition of their country by attracting settlers. The growing need of credit facilitated the settlement of Jews, who probably were at first admitted here, as to other states of Italy, as money-lenders, though they afterward became active as retailers, manufacturers, and tradesmen. The Jews were allowed autonomy; and the government appointed a special judge to adjudicate matters between Jews and Christians. Though the Jews were permitted to dwell anywhere in the city, most of them lived together in certain streets, which were collectively called "La Zuecca." The community of Ferrara was at that time large enough to be represented at the rabbinical congresses of Bologna (1416) and Forli (1418). It was the duty of Elhanan ben Menahem Portaleone and Joseph Hezekiah ben Moses, delegates at Forli, to see that the enactments of the congress were carried out, and that the money necessary to secure papal intervention was paid at the proper time. The Jews of the Romagna shared in the privileges granted by Martin V. in 1419 to secure to the Jews generally the protection of their rights. Fanatical priests, it is true, constantly sought, by threats of excommunication, to incite the populace against the Jews, to prohibit the sale to them of provisions, and to break off all relations with them; but upon the combined requests of the archduke Lionel and the Jewry, Nicholas V. assured the latter the fullest protection and forbade all further incitation to trouble on the part of the priests. The same pope was also petitioned in 1451 by Duke Borso for immunity for having extended to the Jews, who had lived there "from time immemorial," the privilege of further residence, and for having granted them permission to build synagogues. In return for the legal protection which Borso accorded the Jews, the state imposed high taxes upon them, while the princes no doubt borrowed money from them without paying interest. The Jews were further called upon on various occasions to undertake special tasks. In 1456 Borso forced them, as a penalty "for insults to religion," to lay out at their own expense a long avenue of poplars. The dukes of Este not only protected the Jews, but even offered an asylum to those who were persecuted. Thus in 1473 Duke Ercole I. declared, probably in answer to the pope's request for their expulsion, that in the interest of the duchy he could not spare them, and that he would therefore relieve them not only from all special burdens, but also from the payment of the sums formerly extorted as taxes by papal legates. On account, however, of the magnificent buildings which were beingerected, the burden of the ordinary taxes had become so heavy that Alfonso I., in confirming (1505) the privileges of the Jews of Ferrara, decreed that the communities of the province should bear a part of that burden. 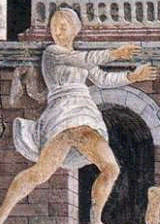 The expulsion of the Jews from Spain and Portugal proved to be a matter of great importance to the community of Ferrara. Ercole I., at the instance of his wife, Eleanora of Naples, granted to twenty-one families which had landed at Genoa the privilege of settling in his territory and of leaving it at any time. They were allowed to follow any trade, to farm the taxes, and to be apothecaries; and the duke even promised to secure for them papal permission to practise medicine among Christians. Their baggage was to be admitted free of duty; but, since the revenues were farmed, and the matter was out of the jurisdiction of the state, the customary rates had to be paid on merchandise. The refugees were to share all the privileges of the other Jews, with the exception of establishing loan-offices, though afterward permits were granted even to do this. On Nov. 20, 1492, the fugitives received their passports, and on Feb. 1, 1493, the final agreement was made. Among those who signed this compact were members of well-known families, like the Naḥhmias, the Abulafias, and the Francos. The immigrants were physicians, merchants, and artisans."